A rich cultural heritage spanning thousands of years, Indian art’s origins can be traced back to Indian cave paintings and rock cut structures that reflect the ingenuinty and skill of their masters. 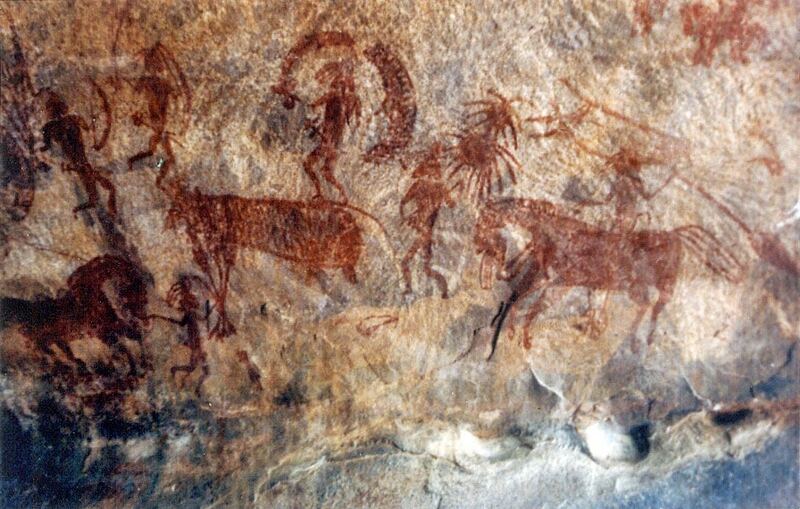 Wondermondo in alphabetic order has listed the best known of the famous Indian cave paintings. One of the highest achievements of ancient people worldwide is Ajanta Caves (Maharashtra) – 29 rock-cut temples made in the 2nd century BC – 480 AD. Colourful, diverse murals in Ajanta Caves serve as integral, extremely valuable addition to beautiful architecture and countless sculptures. Site contains the oldest known Indian cave paintings of historical time – from the 2nd century BC. Paintings are in Caves 1, 2, 6, 7, 9, 10 (oldest paintings from the 2nd century BC), 16, 17 (some of the best cave paintings in India), 19, 20, 26, 27. The beautiful paintings in Armamalai Cave (Tamil Nadu) became known fairly recently: in the late 1960s – early 1970s. This natural cave turned into Jain temple in the 8th century AD. Earlier here were more paintings. The pride of Badami (Karnataka) – the ancient capital of early Chalukya dynasty – is four beautiful cave temples from the late 6th – early 7th century. The ceiling of the most beautiful – Cave 3 still is adorned with beautiful ancient mural showing four-armed Brahma on his swan. Some of the most outstanding early Indian cave paintings – and possibly some of the best paintings from this period worldwide – are in Bagh Cave (Madhya Pradesh), caves 2, 3, 4, 5 and 7. These vivid, lively Indian cave paintings were made in the late 4th – 6th century AD. Some art historians consider that artistic qualities of these paintings surpass the art of Ajanta, Ellora, Sittanavasal (see all in this list). An ancient artist made the paintings of Buddhist religious themes in tempera technique. The beautiful Bhaja Caves (Maharashtra) also contain ancient paintings. Cave 12 – the large shrine – contains paintings of Buddha, which are made after the 4th century AD. The main value of Bhimbetka rock shelters (Madhya Pradesh) most certainly are not medieval and ancient paintings. More than 500 caves contain a lot more ancient artwork: up to 15,000 years old paintings and even more than 290,000 years old petroglyphs. Caves though contain paintings from historical times up to the 14th century AD. Most paintings of this time show hunting scenes, Buddhist monks have added some drawings of deities as well. Ironically here medieval art has lower quality than the prehistoric art. Elephanta Caves (Maharashtra) were built somewhere in the 5th – 8th century AD. These incredibly impressive and beautiful caves once were covered with plaster and painted in bright colors. Nowadays only traces of this painted plaster remain. Ellora Caves (Maharashtra) belong to the highest achievements of mankind both regarding the engineering skills and arts. Already the oldest group of caves here – Buddhist caves from 630 – 700 AD – have paintings of Buddhist pantheon. 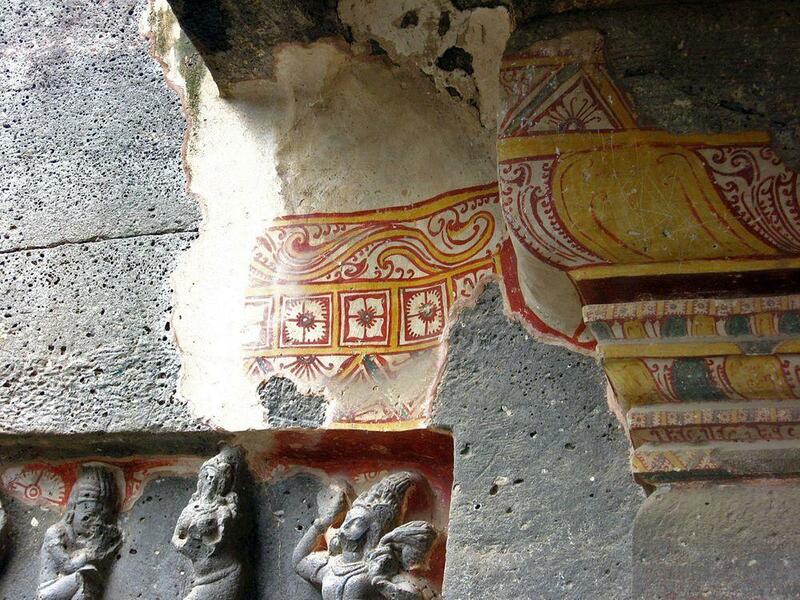 Remnants of paintings are in the most beautiful temple – Cave 16, Kailasanatha which was made sometimes around 760 – 860 AD. 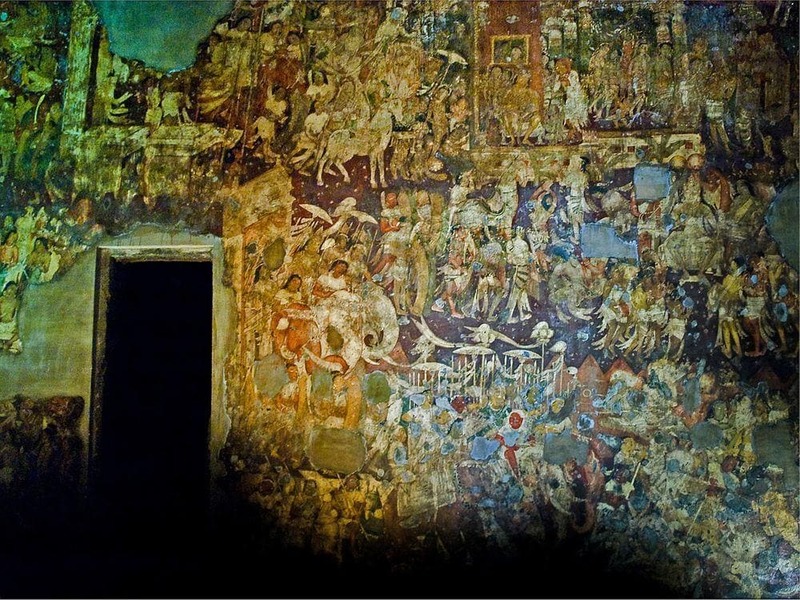 Some Jain temples – Cave 32 (Indra Sabha), Cave 33 – contain remnants of valuable murals from 800 – 1000 AD. This artwork marks the end of ancient period in the Indian art and beginning of medieval art. Unique monument of history is the ancient theater with Jogimara and Sita Bengra Caves (Chhattisgarh). Jogimara Cave – possible dressing room – contains one of the oldest known interior designs in the world made in the 1st century BC. Ancient artists covered the walls here with paintings of non-religious nature showing dancing humans, animals. Some caves in the enormous complex of Kanheri Caves (Maharashtra) at the outskirts of Mumbai contain paintings. 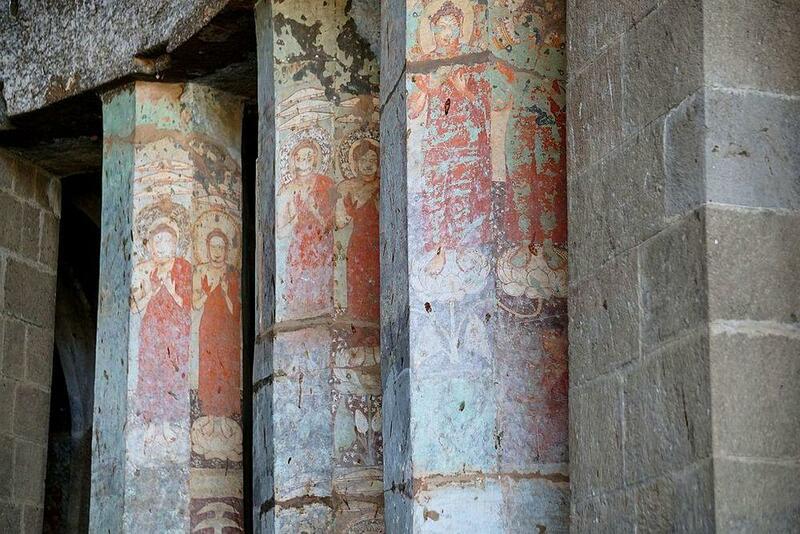 For example, Cave 34 contains painted images of Buddha made before the 10th century AD. Karsamble Caves (Maharashtra) are somewhat less known Buddhist rock-cut temples, hewn in the rock around the 2nd century BC. Here are 37 caves. One of them contains remnants of plaster with bands of red, white and black color. Kuda Caves (Maharashtra) are comparatively little known 26 rock-cut Buddhist temples. Several caves contain remnants of plaster with traces of paintings from the 6th – 7th century AD. Several out of 40 Lenyadri Caves (Maharashtra) – ancient Buddhist temples from the 1st – 3rd c. AD – contain (or at least recently contained) traces of paintings. Cave 7 was converted into Hindu temple and artists adorned it with recent paintings, some of them as recent as the 19th century. Caves 10, 11, 12, 13, 17 though containing traces of ancient Buddhist paintings – for the most part simple ornamental adornment. The cliff walls and ceiling in one of the two rock-cut Hindu temples in Malayadipatti (Tamil Nadu) – Olipathivishnu Vishnugraham (the 8th – 9th century AD) – are covered with paintings. These paintings though seem to be fairly new – from the 16th – 17th century. Manmod Caves (Maharashtra) is a large (45 caves) group of ancient Buddhist and Jain temples cut in rocks. These caves were made mainly in the 1st – 3rd century AD. Remnants of paintings – simple ornaments performed in bad quality – are in cave II, possibly from the 10th – 11th centuries. Some 2000 years ago Pitalkhora Caves (Maharashtra) were among the largest temple complexes in India. These 11 – 14 caves were created in 250 BC – the 4th century AD. In the 4th century, AD temples were adorned with beautiful murals, especially fine paintings have been preserved on columns of Cave 3. Traces of murals are in Cave 6 as well. Aihole (Karnataka), the ancient capital of Chalukya dynasty, contains beautiful rock-cut Hindu temple from around 550 AD – Ravana Phadi. Originally the temple was lavishly adorned with paintings but now only fragments of plaster with coloring remain on the ceiling. Triangular cleft between two giant boulders near Sitabinj was adorned with unique tempera painting from the 7th century. This beautiful drawing seems to be not related to religion and shows royal procession. 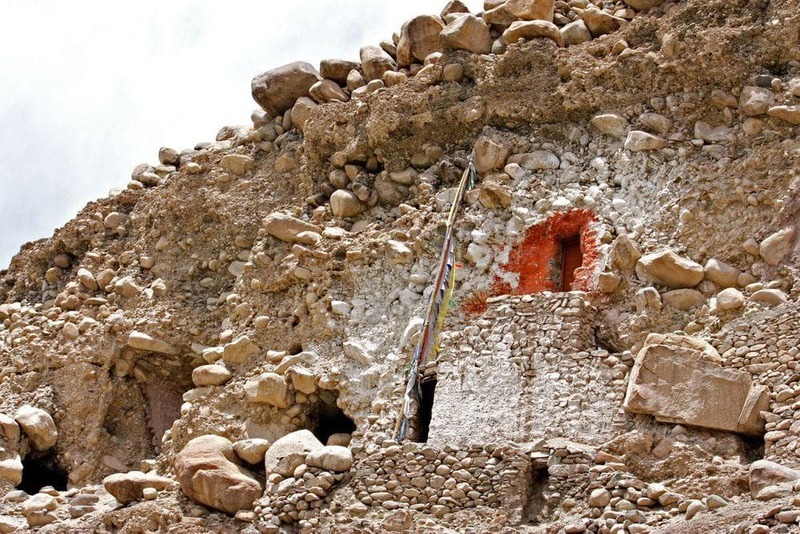 Amazing rock-cut Buddhist temples from the 13th – 15th century AD, located in Jammu and Kashmir. 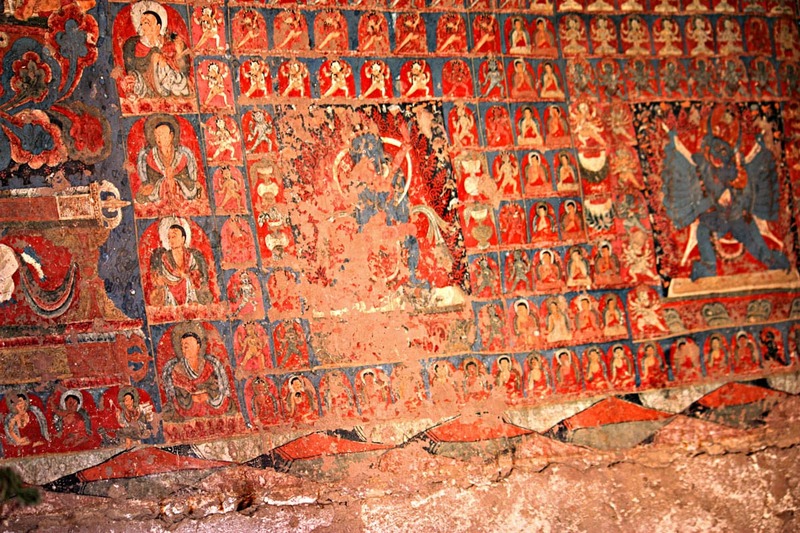 Four caves are lavishly adorned with bright colored paintings of Buddhist panteon. 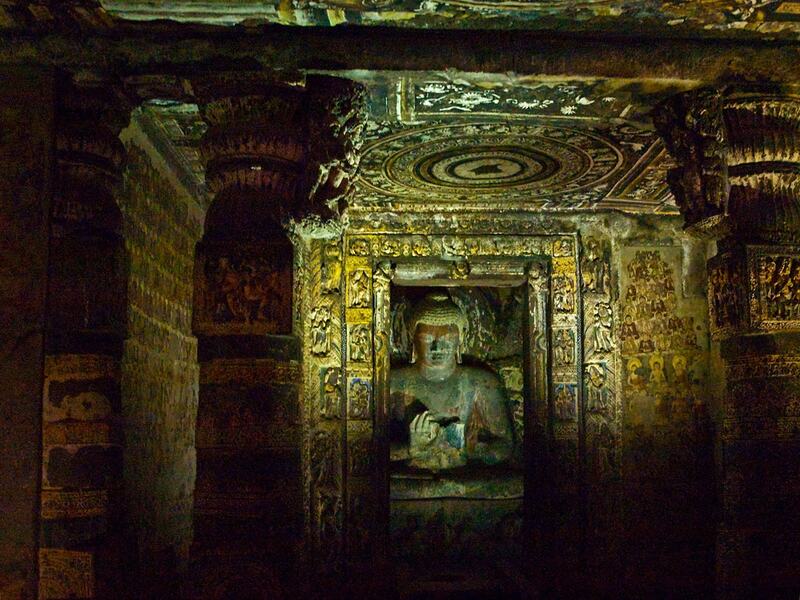 Shivneri Caves (Maharashtra) are 50 rock-cut Buddhist temples, made in the 1st – 3rd century AD. Some caves – No. 26, 28, 29, 32, 36, 38, 42, 43 – contain remnants of ancient paintings – simple ornaments. Wooden beam in Cave 44 contains exquisite Maratha paintings from the 17th century. Some of the most beautiful ancient Indian cave paintings are located in Sittanavasal Cave (Tamil Nadu) – Arivar-Koil. This rock-cut Jain temple was made around the 7th – 9th c. AD. Earlier whole cave was covered with beautiful paintings – now they have been preserved only on the ceiling. Artistic quality, composition and technique of this artwork surpasses most of similar paintings elsewhere. A group of simple, ancient rock-cut dwellings for Buddhist monks of nearby Tabo monastery (Himachal Pradesh). There is controversial information about dim traces of ancient paintings in these caves – but most likely there are no paintings present. Thanale Caves (Maharashtra) are comparatively little known Buddhist rock-cut temples. These 28 caves were made around the 1st – 3rd centuries AD. Cave 13 contains remnants of paintings from the 5th century AD. This rock-cut structure initially – in the 7th century AD – was created as a Jain shrine. In the 9th – 10th century AD it became a Hindu shrine and was adorned with paintings depicting scenes from Ramayana and Mahabharata. Murugan Temple in Thiruparankundram most likely was cut in rock in the 8th century AD. 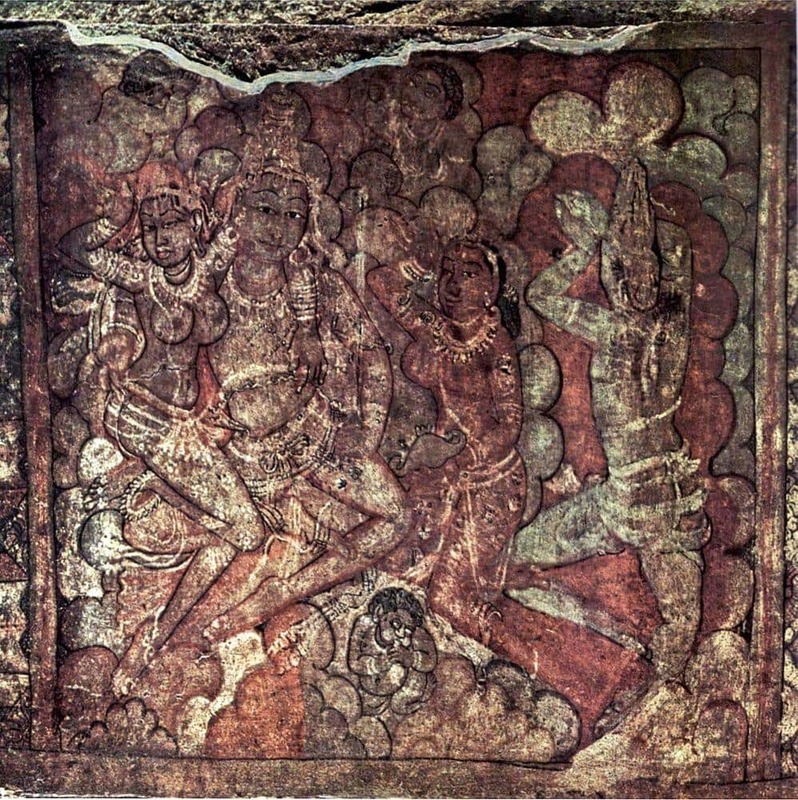 Cave contains visibly ancient painting of Nataraja – dancing Shiva. This group of 11 man-made caves – Buddhist temples – was hewn in rock in the 1st – 3rd century AD. Columns and ceiling in the unusual round shrine in Cave 2 contain traces of once beautiful paintings. Udayagiri Caves were created as Jain cave temples around the 1st century BC, later turned into Hindu shrines. Small shelter next to Cave 6 – Panasa Gumpha – contains simple ochre paintings. The largest Undavalli cave temple (Andhra Pradesh) is unique four-floor structure. 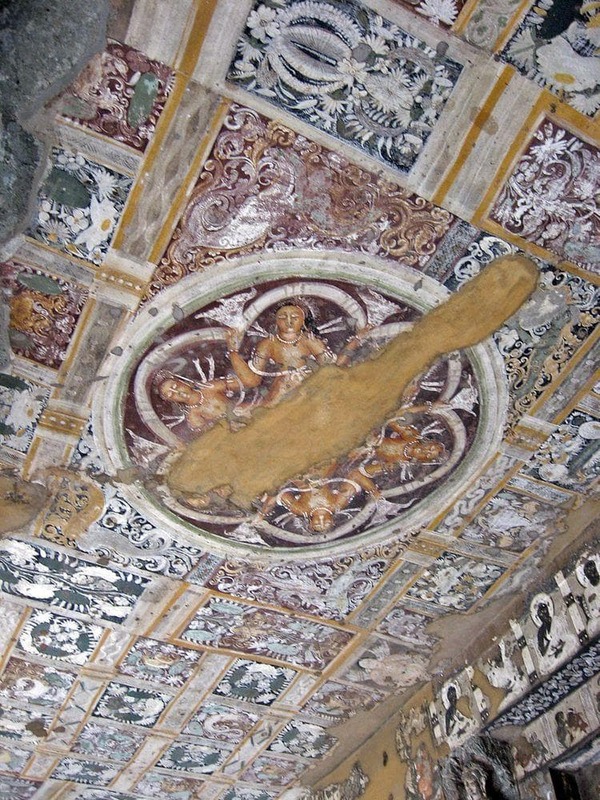 The first floor contains frescoes made in the 7th – 8th century AD, part of paintings is made also somewhat later. Paintings illustrate Hindu mythological stories. One of the keys for successful preservation of paintings is the technique to make them. Ancient and medieval Indian cave paintings have been made mainly in fresco and tempera techniques. But not less important was preparation of surface and laying the plaster. Frescoes in Ajanta Caves were made through especially careful preparations. First, the surface was prepared – the stone surface was chiseled to make rough surface holding the plaster. Then there was laid plaster consisting of clay, lime, hay, and dung. Plastering in Ajanta was done by very skilled artisans – often sculptures were plastered to get an effect of smoothness. Unusual shine was achieved by adding powdered conches and seashells – such polished plaster has glassy surface. Paintings in Ajanta were made while the plaster was wet. This technique allowed to make paintings which preserved much of their original glory even after 1,500 years of abandonment in tropical climate. In Bagh Caves murals were made in tempera technique. Walls and ceilings to be painted were covered with a thick mud plaster in brownish orange color. Over this plaster, there was done lime-priming and then paintings were laid. At the time of their creation, the murals of Bagh were lively, beautiful, expressing vivid imagination and talent of artists. Also Ravana Chhaya (Orissa) was painted in tempera technique. Before applying the color the rough surface of granite was smoothened with a thin coating of lime. Brick walls dividing the shrine into three parts were painted in so-called "Northern style" – tempera technique – just like in Bagh Caves. First, on the brick structure there was laid a thick layer of mud and then it was covered with lime. The material was bound by animal gum. The light surface of lime was suitable to make colorful paintings. Unfortunately these paintings have not been preserved up to this day. Happily Armamalai cave had paintings in the so-called "Southern technique" as well and these paintings have been preserved a lot better. This technique was applied also for paintings in Sittanavasal Cave. Walls of Sittanavasal Cave are not very even and thus the plaster has different thickness – from 1 to 8 mm. Just like in European frescoes the first layer of plaster contains coarse sand and the second is finer. Pigment was mixed with the lime and possibly some gum (in the black pigment) as well. The color was put on dry plaster. It adhered to the plaster extremely well. In Jogimara Cave (Chhattisgarh) the paint was laid on white base plaster although in some places the paint had been laid also on unprepared base. Kuda Caves and Manmod Caves (both in Maharashtra) were plastered with a mix of earth and rice-shaff. Some may believe that artwork of cave temples was made by meditating, self-denying monks of these temples – but this is far from the truth. Just like in medieval Europe, the beautiful artwork of Indian cave temples was made by the groups of professional painters. The most admired cave temples – like Ajanta, Ellora, Badami – were not a shelter from worldliness. These wonderful temples were exactly in the epicenter of mundane ambitions, rivalry, and showoff. Thus it is quite possible that the brilliant work of ancient masters was expensive and these masters – very well known and much sought after. Armamalai Cave serves as interesting proof for the theory that some art styles were spread by guilds of artists moving around the country in search of work. This southern cave temple contained murals made in northern tempera technique – in these times (the 8th century AD) the demand for construction and art in Southern India was in demand and there could be more than enough work for experienced northerners. There is noticeable also division of work among the different specialists – for example, one was drawing outlines, another – coloring them. Often there can be observed repainting of the same mural. Thus, for example, painting in Jogimara was done in two layers – the original by an expert artist in the 1st century BC and the latter by another artist, in inferior quality. Ancient and medieval artists had profound knowledge (which is lost now) about the natural pigments. Colors made of plants and minerals did not bleach when mixed with lime and very well withstood the test of time. There were mastered several colors, thus, for example, in Sittanavasal painters used black, green, yellow, orange, blue and white pigments. Only today it sounds simple – back then these chemical compounds had to be tested – how they react with plaster, each with other, with water and glue, how they change after the plaster has fully dried. Drawings inevitably change over time. This process is slower if the painting is well hidden from the Sun and water. But even in such circumstances colors slowly degrade and become less intense. Damp air in tropical conditions brings other problems. In Sittanavasal Cave damp air facilitated growth of slime consisting of algae and lichen – throughout the centuries it covered the paintings. This slime had to be removed mechanically – with strong brushing in 1942 (Shri S.Paramasivan, K.R.Srinivasan) – happily, paintings withstood this well. Nowadays there comes another danger – dorky people leaving graffiti wherever they like. This is surprising – the paintings luckily have survived thousands of years until one day comes somebody to spray over his worthless name. Unfortunately, most of the Indian rock-cut cave temples stand unprotected from this curse. World is not rich with ancient paintings – due to this Indian cave paintings certainly deserve a lot more attention and care than today. This small Internet encyclopedia reviews a fascinating kind of the rich Indian cultural heritage – Indian cave paintings. Ancient and medieval artists created these artworks over the last 2,300 years – since the beginning of historical period. Why such interest in this theme? There have been preserved rather many ancient paintings in India – in spite of the fact that painting is comparatively short-lived and fragile art. It disappears together with its base – paper, fabric, wood, plaster and even walls of stone masonry buildings. Due to this today we have very few examples of ancient painting – although many indications show that painting has been very popular and well developed form of art since many thousands of years. Caves and rock-cut structures sometimes provide suitable conditions for paintings to survive – paintings here survive not just centuries but even tens of thousands of years. Due to this the paintings in caves, on natural rock face provide the only possibility to see the ancient paintings (another, less convenient possibility is provided by ceramics). In this respect each rock painting resembles a keyhole through which we see the abundant and vital life of our ancestors. India is extremely rich with ancient rock-cut cave temples – no other region in the world can compete with India in this respect. Geology of Deccan Plateau and some more regions of India provides enough cliff faces and domes perfectly suitable to create rock-cut architecture. It is estimated that there are more than 1,500 individual rock-cut caves in India and there still are discovered new ones. Basalt, diorite, granite is widespread in Deccan Plateau – these rocks can be tough and time resistant, thus providing an ideal basis for paintings. A shade of deep cave and skillful protection from seeping water provide ideal protection from elements. A large area of India and diversity of cultures promise diversity in artistic styles as well. Since the beginning of historical times (approximately the 3rd century BC) India experienced several periods of extreme flourishing and diversity of culture. Cultural heritage of India can be compared with the stars in the sky – everyone can look at it but no one is able to grasp the true extension of it. Painting is just one of the dimensions of Indian culture. But knowing the distinguished and extraordinary achievements in other arts, we can expect values of world importance also from Indian painting. Natural caves and smaller shelters in India very often contain prehistoric paintings. Description of these monuments is not a purpose of this page but short insight is useful. Monuments of exceptional value are Bhimbetka Rock Shelters – here more than 500 caves and smaller rock shelters contain thousands of paintings. The oldest paintings here are some 15,000 years old but maybe – even 30,000 years old. Thus Bhimbetka may contain some of the oldest paintings made by humans. By the way here are the oldest petroglyphs in the world – at least 290,000 years old cupules. Prehistoric art is spread all over India from the south of Tamil Nadu to the snow-covered Himalayas. Nowadays we have made an artificial border in time – between prehistoric and historic times – but we can be rather sure that painting and other arts did not experience any "step over a threshold" with the beginning of historical times, there was developed a tradition well before. This long matured tradition is well manifested in the oldest preserved cave paintings in India. Cave 10 in Ajanta Caves contains the oldest Indian paintings of historical period, made around the 1st century BC. This artwork is far from primitive – we see a work of experienced, professional artists. Major part of paintings in Ajanta though are from later time – mainly from 460 – 480 AD. Murals in Ajanta are world-renowned and tell stories of the life of Buddha and other plots characteristic for Buddhist art. Women in these drawings are beautiful. How else? Many of woman paintings and sculptures depict such mythical beings as yakshas, nagas, vrikshikas, river goddesses Ganga and Yamuna. Supernatural beauty is part of the essence of such beings. Unique monuments of art not only for India but for the whole world are paintings in Jogimara Cave (Chhattisgarh). These paintings were made around the 1st century BC. Contrary to other ancient Indian cave paintings these drawings are not related to religion: here is adorned a rock-cut cave. It looks like actresses of the nearby open-air theater used this cave as a dressing room. Paintings show dancing couple, fish and elephant figures, seen also an unclear painting of chariot. Several Pitalkhora Caves (Maharashtra) were adorned with beautiful paintings in the 4th century AD. Visitors of the caves can see remnants of these paintings on columns in Caves 3 and some other caves up to this day. Some of the most beautiful ancient Indian cave paintings have been preserved in Bagh Caves (Madhya Pradesh). Artists created this truly brilliant sophisticated artwork around the 4th – 6th century AD. Paintings are also in the royal Badami Cave Temples (Karnataka) from the late 6th – 7th century AD. Here the ceiling of the magnificent Cave 3 still is adorned with a drawing of four-armed Brahma on his swan. Unusual monument of art is tempera painting in natural cave shelter – Ravan Chhaya rock shelter near Sitabinji (Orissa). In the 7th century here has been painted royal procession – it is possible that this shelter served as a royal hunting lodge. The review of ancient Indian cave paintings started with Ajanta Caves and it ends with the other greatest achievement of Indian rock-cut architecture – Ellora Caves (Maharashtra). Some five caves contain traces of paintings here. Somewhat better preserved are the paintings in the most magnificent Hindu temple – Kailasanatha (Cave 16, built around 760 – 860 AD). Here the drawing has been repainted at least three times. 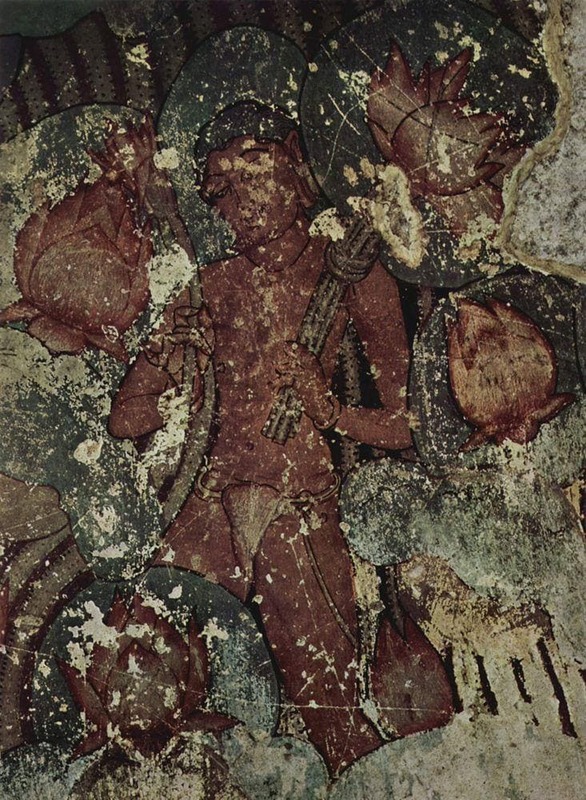 Later Jain temples – Cave 32 (Indra Sabha) and Cave 33 from the 9th – 11th century contain remnants of beautiful murals which in their artistic technique show the beginning of medieval period in Indian painting. Less impressive traces of ancient Indian cave paintings from the 3rd – 8th centuries AD are in rather many cave temples of Maharashtra – Karsamble, Thanale, Kuda, Lenyadri, Shivneri, Tulja Lena, Manmod, also famous Elephanta Caves and Bhaja Caves. Traces of paintings are found also in Ravana Phadi – exquisite cave temple from 550 AD in the ancient capital Aihole (Karnataka). In early medieval times the most beautiful Indian cave paintings were created in Southern India. Exceptional – but still comparatively little known – monument of Indian art are paintings in Sittanavasal Cave (Tamil Nadu). In the 7th – 9th century AD here was made rock-cut Jain temple named Arivar-Koil. Most paintings here are made in the 9th century AD and still cover the ceiling and upper part of columns. 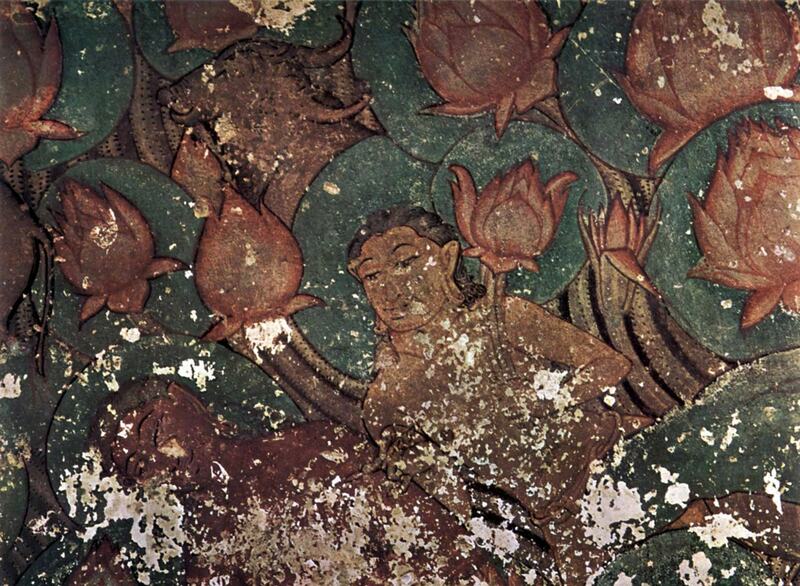 The central element of the marvelous frescoes in Sittanavasal is a pond with lotuses. Flowers in this pond are collected by monks, there are shown ducks, swans, fishes, and animals. This scene shows Samava-sarana – important scene in Jain religion. Samava-sarvana is special, beautiful audience hall where Tirthankaras (great liberated souls in Jain religion) delivered sermons after they reached realization (kevala-gnana). Bulls, elephants, apsaras, and gods gathered in this audience hall to witness this grand scene. Armamalai Cave (Tamil Nadu) is natural cave which served as Jain sanctuary around the 8th century AD. On the ceiling and walls still are beautiful color paintings, such as standing lady with people, lotuses and other floral motives. Thirunadhikkara Cave Temple (now Tamil Nadu, earlier Kerala) is rock-cut Jain temple from the 7th – 8th century AD. In the 9th – 10th centuries AD it was converted into Hindu shrine and decorated with beautiful paintings. Now only hazy outlines remain – but once upon a time, these were colorful depictions of the stories from Ramayana and Mahabharata. The style of these paintings later evolved into Kerala style of painting frequently used in built temples. Olipathivishnu Vishnugraham is Vishnu temple, one of Malayadipatti rock-cut Hindu temples (Tamil Nadu). The oldest part of this temple is a rock-cut structure from the 8th – 9th century AD. Much of this temple – sculptures and walls – are covered with stucco and paintings. Most likely these paintings are much younger – from the 16th – 17th century. Drawings show ten incarnations of Vishnu – Dashavatara and other motives of religious nature. Rock-cut cave temples and dwellings for monks were made also in the far north of India – Himalaya. Several cave temples with beautiful paintings are in Tibet and Nepal, but at least one is located also in India. Saspol Caves (Jammu and Kashmir) are amazing rock-cut temples from the 13th – 15th century AD. Four of these caves are lavishly adorned with paintings of Buddhist pantheon. The dominant color here is bright blue, but paintings themselves represent an exciting fusion of Tibetan and Indian Buddhist art. 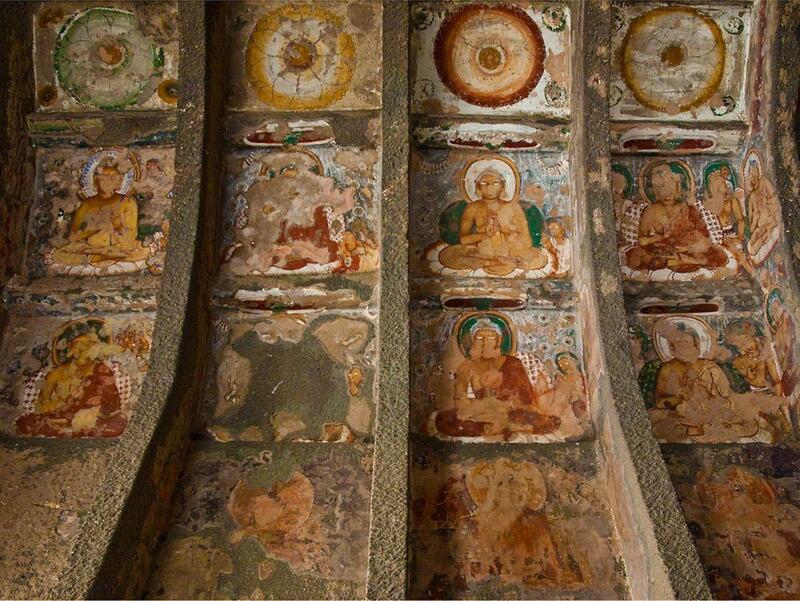 Wondermondo has found uncertain information about faint traces of paintings also in Tabo Caves (Himachal Pradesh). More beautiful wall paintings are in the nearby Tabo Monastery. Medieval paintings from as late as the 14th century AD were made even in Bhimbetka Rock Shelters (Madhya Pradesh). Thus these caves contain medieval paintings next to some of the oldest cave paintings in India. But art lovers would be rather disappointed by the quality of medieval Indian cave paintings in Bhimbetka – the drawings here look unprofessional, amateurish. Medieval Indian cave paintings are found also in Murugan Temple, Thiruparankundram (Tamil Nadu), Kanheri Caves (Maharashtra), Manmod Caves (Maharashtra), Undavalli (Andhra Pradesh). Mural Painting Traditions in India: Content, Conservation & Challenges, Dakshina Chitra. How do archaeologists explore the various dimensions of religion? Lars Fogelin uses archaeological work at Thotlakonda in Southern India as his lens in a broader examination of Buddhist monastic life. He discovers the tension between the desired isolation of the monastery and the mutual engagement with neighbors in the Early Historic Period. He also sketches how religious architectural design and use of landscape helped to shaped these relationships. R.S. Sharma, one of the best-known historians of early India, provides a comprehensive yet accessible text on the ancient period of Indian history. Beginning with topics such as historiography and the importance of Ancient Indian history, he goes on to cover the geographical, econological and linguistic settings, before looking at specific cultures of neolithic, chalcolithic types, the Harappan civilization, the Vedic period, the rise of Jainism and Buddhism, Magadha and the beginning of territorial states, the age of the Mauryas, Satavahanas, Guptas, and Harshavardhana.